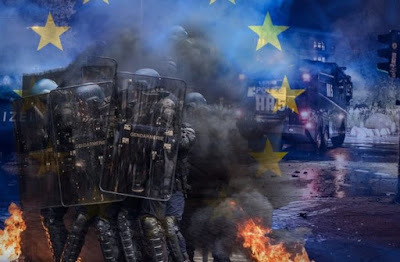 ARRA News Service: Belgian Political Leader Predicts European Civil War . . .
Belgian Political Leader Predicts European Civil War . . .
by Voice of Europe: A leading member of the Belgian right-wing party, Vlaams Belang, said we could be close to a civil war in Europe. “Lynching, violence and vandalism, the urban guerrilla is portentous,” Filip Dewinter writes on Twitter. The leading member of Vlaams Belang, reacted on twitter to the French World Cup riots, during which shops were looted, police were attacked and hundreds were injured. In his tweet he added footage of a white man being ambushed by several migrants. There will be a point in time where this ethnic violence will be large-scale then there won’t be much needed for the situation to explode. Tags: Voice of Europe, Belgium, political leader, predicts, European Civil War, Governments, Losing Control To share or post to your site, click on "Post Link". Please mention / link to the ARRA News Service and "Like" Facebook Page - Thanks!